From 16 to 22 October 2016, the students of the Natolin campus of the College of Europe took part in a study trip to Ukraine, entitled "Against All Odds: Transformation in a Time of War". The study trip was also featured on our Twitter and Facebook pages. This tailor-made study trip, organised by the College of Europe Natolin campus, had been preceded by a series of five preparatory lectures held at Natolin on themes spanning from history to the present day, from revolution to conflict. The series was opened by Professor Richard BUTTERWICK-PAWLIKOWSKI, Chairholder of the European Civilisation Chair, who discussed "the Inheritance of the Christian Rus". Professor Alan RILEY moved to the present day, lecturing on the topic "Russian Energy Strategy: the implications for and responses from the EU" and setting a geo-strategic background for in-depth discussions whilst in Kyiv. Professor Michał NATORSKI reflected on the current state of EU-Ukraine relations, "Crisis, war and domestic transformations", while Professor Tadeusz IWAŃSKI shed light on the question "Break up, separation, or divorce? Ukrainian-Russian relations after the Revolution of Dignity". The preparatory lectures were concluded by a lively discussion with Ms Kateryna PRYSCHEPA, who explored the question "What makes an oligarchy? The case of Ukraine". 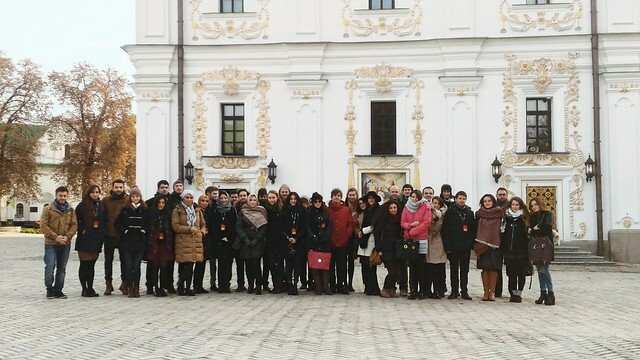 The study trips have always been an essential part of the academic programme at Natolin. The vital aims of the study trip to Kyiv and Lviv were to enable students to develop their awareness of, and sensitivity to the challenges currently faced in Ukraine, but also to present its complex history, impressive culture, and remarkable society. During their visit to Kyiv and Lviv, students had the chance to meet with VIPs, diplomats, government officials, policy-makers, scholars, and experts, to discuss topics such as diverse aspects of the conflict between Ukraine and Russia, Ukraine’s energy security, its relations with the EU and other external actors, Ukraine’s internal reforms, the sociopolitical consequences of Euromaidan, the composition and activities of Ukrainian civil society. Last but not least, our students had the opportunity to admire monuments and artefacts of Ukrainian culture. The planned events allowed the students to understand the richness of Ukrainian history, the gravity of present challenges that Ukrainian society faces and its perseverant determination to overcome them.